Over 7,000 homes were chosen at random and asked to participate in a face-to-face interview regarding their health and lifestyle choices. Of this 7,000 roughly 81% agreed to take part. Whilst the population sample was relatively small, the Survey represented a massive undertaking with many homes being visited 2-3 times during the course of the Survey (Healthy Ireland Survey, p. 12). The scope of the Survey is remarkably broad, covering topics like exercise, social wellbeing, diet and nutrition, lifestyle choices and sexual behaviours. Enough to keep any anorak busy! Like all surveys of this nature, a considerable amount of data cleaning was needed to account for discrepancies and bias (p.13). So the figures should not be taken as gospel but rather as a very methodical guesstimate. Comparisons with other nations should also be taken with a pinch of salt. In the section given on Physical Activity, the question was asked if the participant achieved at least 30 minutes a day of moderate activity on 5 days a week (p. 30). In itself this is a great question and one the Irish Sports Monitor has been using for years to determine physical activity levels. The problem is that the wording of this question is slightly different to the questions asked in other nations, which means that other nations often appear to be more active than Ireland. Coupled with the above technical matters we have to take into account that the interviews were conducted face-to-face and as such participants may have felt pressurised into giving ‘correct’ answers. 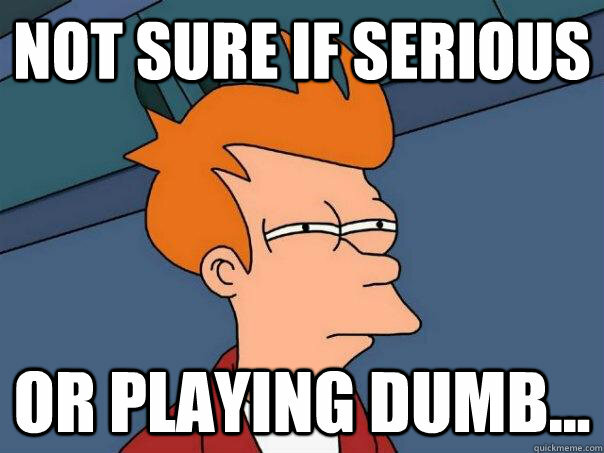 For example, in the section on smoking, the majority of smokers interviewed (63%) claimed they are trying to, planning to or considering quitting smoking (p. 20). Whether or not this will play out in the future is another matter. Remarkably there appears to be a real disconnect between the answers given by the majority of the participants and the situation on the ground in Ireland. The average number of GP consultations amongst those aged 15 and over is 4.3 per year (p.20). Compare this to 1.4 consultations per year with a medical or surgical consultant (ibid.). This glaring discrepancy could well be due to the fact that the interviews were held face to face. It has been consistently shown that people tend to over-estimate their good health markers and underestimate their poor ones (reference). Regardless of why the discrepancy exists, a frank conversation needs to be had about why the majority of people saw themselves as being in good shape even though only 32% of the sample population were ‘sufficiently active’ (p. 30). When it came to discussions about diet and nutrition however, the results were a mixed bag. Most people reported that they cooked from scratch using fresh ingredients, ate fruit and vegetables every day had breakfast every day (p. 38). Results that I think everyone will agree are good. Unfortunately it appears that junk food and fizzy drinks are the downfall of the Irish citizen. 65% of participants reported they consumed snack foods or sugar-sweetened drinks daily (p. 36). 62% revealed that they eat snack foods daily, consuming an average of 2.0 portions per day (p. 37). 15% of participants drink sugar-sweetened drinks daily, with men aged 15-24 most likely to drink these (29%) (p. 38). 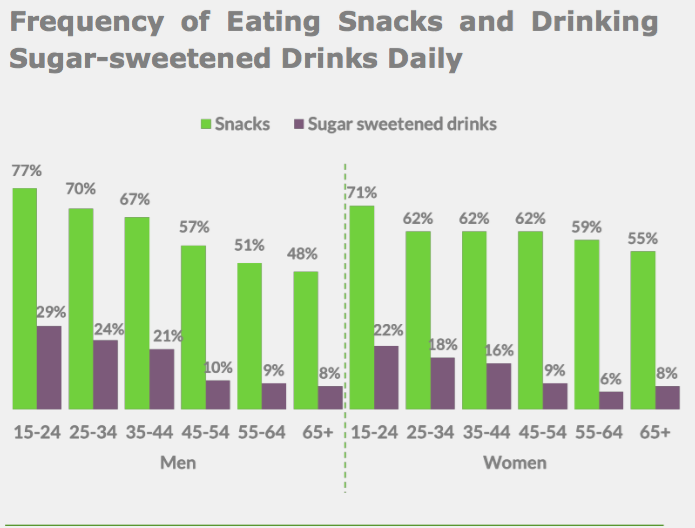 ‘Frequency of Eating Snacks and Drinking Sugar-sweetened Drinks Daily, Healthy Ireland Survey, p. 36. The fact that the majority of sugary drinks and snacks were consumed by the youngest in Ireland is serious cause for concern. Just this month, Professor Ailish Hannigan and her research colleagues at University of Limerick published an in depth study on childhood obesity in Ireland which suggested that whilst levels of childhood obesity are at a tipping point, many mothers seem unaware that their child is obese. Failure to identify the problem could lead to negative health behaviours continuing. No and don’t let anyone tell you otherwise. Earlier in the year, the Irish Media whipped up a panic after a WHO report suggested that the majority of Irish people would be overweight by 2030 (see here, here and here for example). Worse still, we were told that Ireland would be the fattest nation in all of Europe. Soundbites like these are great selling papers and scaring people but they ignore the good work done by government bodies, sports clubs and local people interested in health. Whilst the current Fine Gael/Labour government has shown a remarkable ability to anger the Irish public, they have enacted a series of measures aimed at tackling the problem. Outside of government, sporting bodies like the GAA have brought about Healthy Club initiatives with substantial backing from Irish Life, whilst the FAI have provided supported for the Eat Right, Play Right initiative aimed at educating children about healthy life choices. This is to say nothing of the dozens of clubs ranging from American Football to Wrestling that provide training to thousands of Irish people every week. Finally people in certain local communities are beginning to take charge and create opportunities for physical activity. In my own area, running groups have become a regular sight each evening with dozens of children jogging under the supervision of adults. Steps are being taken in the right direction, regardless of what the media reports. More needs to be done, especially with regards to more deprived areas, but at the moment we have every reason to be optimistic that positive change will happen.